Start now saving on your money with this latest week gap flyer, sales, offers, promotions, specials, deals and coupons. 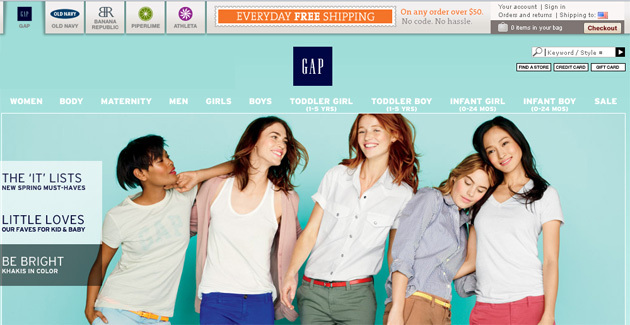 View the current gap flyer to save on all products offerted by gap ! Find all the deals & specials for gap in the current flyer below. Doris and Don Fisher opened the first Gap store in 1969. The reason was simple. Don couldn’t find a pair of jeans that fit. They never expected to transform retail. But they did. Guided by humility, compassion and a strong desire to win, the Fishers grew their company thoughtfully. Customers responded. Today, Gap Inc. is a leading international specialty retailer with five brands – Gap, Banana Republic, Old Navy, Piperlime and Athleta – about 3,100 stores and 134,000 employees. We’re growing globally, and just last year, we opened our first stores in China, Australia and Italy. We’re expanding online shopping to customers, too. Today, customers in over 80 countries can buy our products. While many things have changed since 1969, the principles on which we were founded have stayed the same: creativity, delivering results, doing what’s right and always thinking of our customers first.